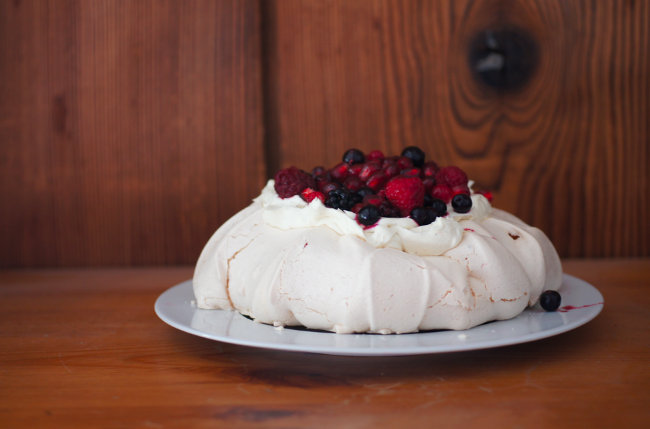 When I was a girl, we always had pavlova for pudding at Christmas. Though it wasn't shrouded in flickering blue flames like its traditional rival, I thought it was the most exciting part of the whole lunch. Granny would top her pavlovas with defrosted raspberries saved from the summer bounty. In memory of her I used some frozen mixed berries on our Christmas pavlova. I also scattered over some fresh pomegranate. When I came to photograph the fruit I found myself trying to create the same (lovely) pomegranate shot I've seen so many times. Instead I decided to try and make it mine. So in the middle of our sitting room I started splashing the pomegranate quarters into the waiting bowl of water, holding my camera in the other hand. I must have looked pretty sheepish when mum found me drenching the white sofas and rug in the midst of torn up wrapping paper from earlier in the day. She moved me outside onto the balcony (thankfully not as cold as last time) and dropped the quarters into the bowl for me. Arthur tried to 'help' and got in the way. Not only did I get a photo I like but I also got a Christmas memory I'll always remember with a smile. I've had some troubles with our old recipe over the past few years so I decided to try a new one from this gobsmackingly beautiful post by Katie. It's a great recipe - it feels stable as you heap it on the sheet and bakes into a soft pillow of marshmallow-esque filling with a nice crisp shell. I like some contrast so I barely sweetened the berries and kept the cream simple. It's a classic for a reason. Preheat the oven to 150C (or 130C for a fan oven). Line two trays with baking parchment. Rub the clean bowl of a stand mixer (or a mixing bowl if you're using a hand whisk) with the slice of lemon. Add the whites and whisk until you have a thick froth that forms a soft peak then start slowly adding the sugar. Keep whisking until glossy and holds a fairly stiff peak. Add the vanilla and sift over the cornflour, then whisk briefly to combine. Divide the mix between the two trays, heaping it up in the middle. Use a spatula to spread out into a large nest shape (I then brought the spatula in around the sides to create a pattern. Bake for 30 minutes then swap the trays and turn them around to help them cook evenly. Bake for another 30 minutes then turn the oven off and leave them to cool for one hour. Afterwards, take them out and leave to cool totally on a wire rack. They'll store for at least a week if needed. When you're ready to serve, defrost the fruit. Sprinkle the icing sugar over the top to lightly sweeten them without breaking them down. 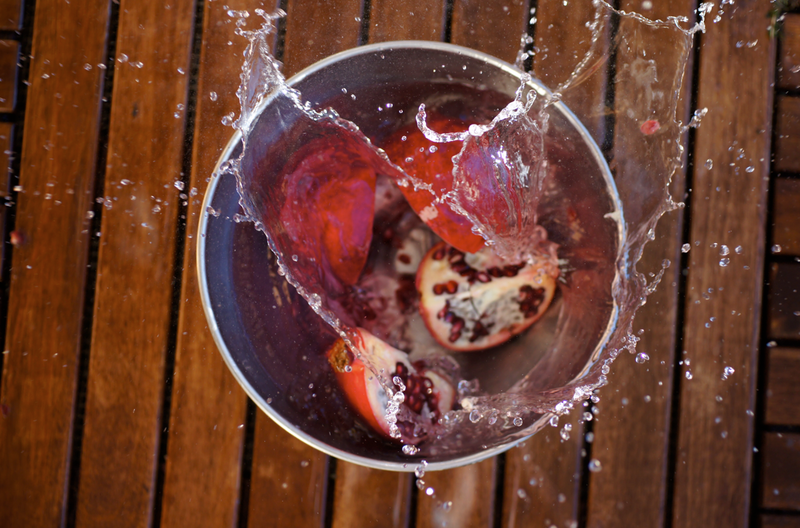 Cut the pomegranate into quarters and de-seed in a bowl of water. Whip the cream and vanilla until soft peaks form. Knock the centre of the pavlova gently in then spread the cream over. Top with the summer fruits and pomegranate seeds and serve. That pavlova looks gorgeous! I bet the defrosted frozen berries go beautifully with it. Your photos look fantastic! I love the pomegranate shot! Haha I can imagine your Mum walking in on you while you were doing it, my fiance regularly walks in on me making a mess while taking photos. That pavlova looks gorgeous, hope you have a happy new year! I adore the photos on this post - especially the pomegranate shot it looks amazing but so hard to do with camera as well or did you have help? I want to have a go at that now. Your whole site is a true inspiration. That pomegranate shot is amazing, what a brilliant idea. 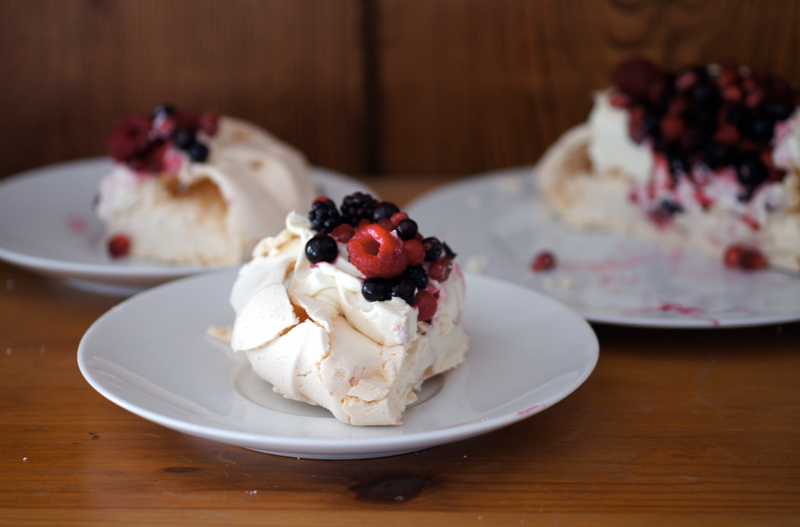 Pavlova sounds like a lovely Christmas day pudding too, much lighter than the traditional offering. Beautiful shot of the pomegranates! Pavlova is one of my favourites. Happy New years in advance! My OCD wouldn't allow me to wet my kitchen to take that (AWESOME) pom shot. Pavlova is always something I'd bake with leftover egg whites. Adding pom just makes it. Happy New Year Emma! 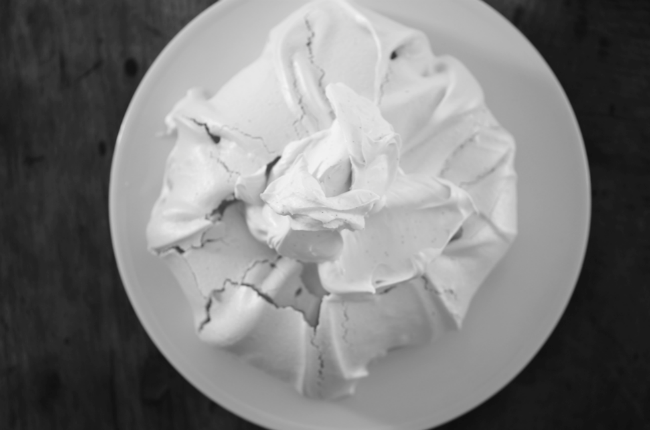 I love the contrast of creaminess, chewiness and crunch in a pavlova and yours looks perfect. I'm not a fan of Christmas pudding so always looking for an alternative. 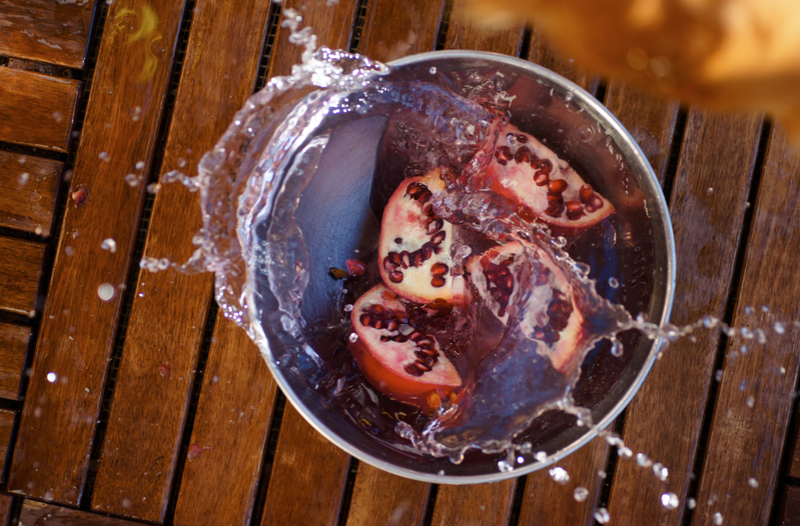 LOVE the pomegranate photo too, it's gorgeous. Do you get the seeds out by putting them in water rather than tapping? "gobsmackingly," coolest word ever. This is a stunning recipe, I must admit I've never made pavlova myself. Happy New Year, friend. Mmm this looks so amazing! I've tried a recipe like this before out of a Bon Appetit magazine, but since have misplaced it.. very glad to stumble upon your recipe! Beautiful photos! Koci - Thanks! 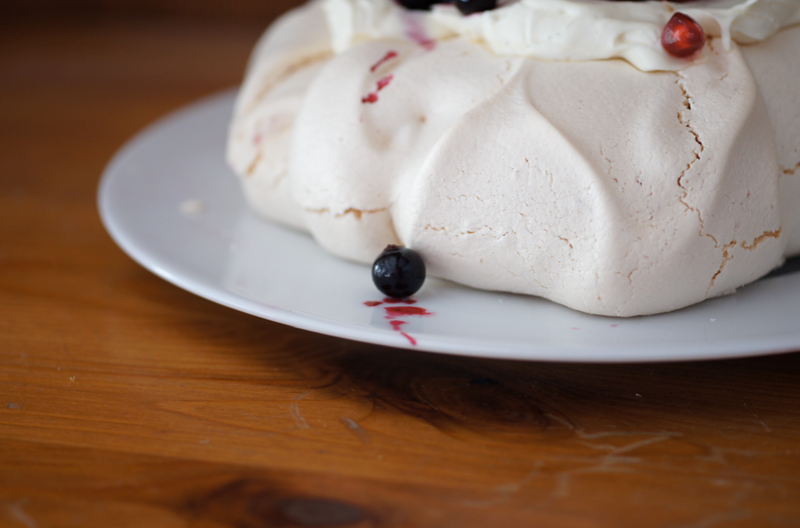 The berries are quite tart so they're perfect for balancing out all the sweetness of the meringue. Steph - Hehe - it's an occupational hazard of food blogging! I think the biggest mess I've made was with the marshmallows this summer. I even got the dog covered in icing sugar. Happy New Year! cakeboule - I'm so glad you like the photos! In the end I had mum dropping the fruit into the bowl while I took the photo - I didn't have a tripod or anything, just a fast shutter speed. It's not too difficult, you just have to get the timing right :) It's great fun, give it a go! Laura - It's lighter than christmas pudding but still quite rich! Delicious, though. Glad you like the pomegranate shot! Emiko - Thank you! It's such a great pudding - so many ways to adapt the flavours. Daisy@Nevertwoosweet - high praise from an Aussie! Thanks :) They are a bit sweet if you sweeten the cream and use fruit that doesn't contrast - that's why I use quite tart berries. Happy New Year! pickyin - Hehe well in the end I moved outside - maybe something to play at during the summer?! It's a great pudding to have in a repertoire. Happy New Year! thelittleloaf - It is a gorgeous set of contrasts, I agree. I was taught to take the seeds out underwater as it's not as messy (well, until you start splashing about...) - I just ease them out with my fingers. Kelsey - It is a great word! You should try pavlova, it's a great recipe to have in your pocket, especially as you can make it a few days before you need it. I'm very touched that you called me friend :) Here's to 2012! Billy plus Rachel - Glad you've got another pav recipe now! Thanks and Happy New Year! my problem. May be that's you! Having a look ahead to peer you. publish, would not get to a medical facility over time.